Last week, we looked at Indiana’s Public Intoxication Laws. This week, we are going to look at the related concept of the Indiana Disorderly Conduct Laws. Disorderly conduct is sometimes known as disturbing the peace in other states. Disorderly conduct and public intoxication are sometimes charged together, but not always. The obvious difference between Indiana disorderly conduct law and its public intoxication law is that public intoxication requires an individual to be intoxicated. Another difference is that In Indiana, disorderly conduct does not have to take place in public to be charged. In Indiana, a person can be charged with disorderly conduct in their own home. Potential Defenses to Indiana Disorderly Conduct Charges. If you are facing disorderly conduct charges in Indianapolis, Marion County, Noblesville, Hamilton County, or a surrounding central Indiana county, we recommend you speak to an Indianapolis Disorderly Conduct Lawyer about the Indiana disorderly conduct laws and the specifics of your case. Disorderly conduct in Indiana is a criminal charge, not an infraction, so Indiana disorderly conduct charges are nothing to scoff at. A conviction for disorderly conduct in Indiana will stay on your record for life, unless you expunge it. That can be embarrassing or may stop you from getting a particular job you may want. And, at the earliest, you cannot expunge it for five years after the date of your conviction. If you have been convicted of disorderly conduct, or other crime, and are interested in expunging your criminal record, visit our Free Indiana Expungement Evaluator to see if you qualify for an expungement in Indiana. Every criminal case is different based on the specific facts of each case; therefore, it is important you speak to an Indiana Disorderly Conduct Lawyer to discuss the specifics of your case. Let’s start with looking at the Indiana Disorderly Conduct Statute. is committed in an airport (as defined in IC 8-21-1-1) or on the premises of an airport, including in a parking area, a maintenance bay, or an aircraft hangar. (2) adversely affects the funeral, burial, viewing, funeral procession, or memorial service. As we can see from the statute, the penalty for an Indiana disorderly conduct conviction is a Class B Misdemeanor for the basic offense. Class B Misdemeanors in Indiana are punishable by up to 180 days in jail, and a fine of up to $1,000.00. However, the penalty for an Indiana disorderly conduct conviction is a Level 6 Felony if it occurs in an airport (and adversely affects airport security) or within 500 feet of funeral proceedings. Criminal sentences for Level 6 Felonies in Indiana range from 6 months up to 2.5 years, with a fine of up to $10,000. Now that we have seen the statute and looked at the penalties, lets look at some examples of cases where the court interpreted the Indiana Disorderly Conduct Statute. In D.R. vs. State, the Indiana Court of Appeals found that where a teacher was the only person standing near the juvenile at the time of their encounter when the juvenile muttered an expletive at the teacher, the evidence was insufficient to support the trial court’s finding that the juvenile committed the offense of disorderly conduct by disrupting a lawful assembly of persons. But in McMiller v. State, the Court found that the State presented sufficient evidence that defendant committed Class B misdemeanor disorderly conduct because he was talking loudly, upset because he was going to jail, and he was disrupting the booth next to where he was sitting. However, disrupting a lawful assembly of persons is only one method of being charged with disorderly conduct. It does not have to occur in public like a public intoxication charge. Instead, Indiana’s disorderly conduct statute applies to both public and private disturbances. In Lynn v. State, the Court held that the State presented sufficient evidence to sustain defendant’s conviction for disorderly conduct because defendant engaged in a hostile encounter with the victim that was both physical and verbal in nature, and thus, the evidence was sufficient to establish that defendant engaged in fighting; defendant became aggressive and punched the victim’s forearm, and he also tried to strike the victim in the face with his cane. In Blackman v. State, the Court held there was sufficient evidence to support defendant’s conviction for disorderly conduct because defendant produced decibels of sound that were too loud for the circumstances because: (1) the sheer volume of defendant’s outbursts disrupted police officers’ investigation and attracted unwanted attention; (2) the officers repeatedly asked defendant to lower her voice and to leave the scene of their investigation; (3) defendant defiantly ignored their requests and shouted even louder; and (4) the ensuing commotion drew a crowd. In Anderson v. State, the Court felt that the State presented sufficient evidence to support defendant’s conviction for Class B misdemeanor disorderly conduct arising out of defendant’s refusal to leave a business establishment when asked to do so several times and defendant’s resulting verbally disruptive conduct. The evidence showed that defendant recklessly, knowingly, or intentionally made unreasonable noise and continued to do so after being asked to stop. In Yowler v. State, evidence that when a police officer came to defendant’s home to serve a letter that barred defendant from the property of a public school, defendant exited his home, flailed his arms and yelled, used profanity, directed vulgar names at the officer, continued to yell after being asked to stop, and created a disturbance sufficient to cause his neighbors to come out of their homes, was sufficient to support defendant’s conviction for disorderly conduct. In Martin v. State, the defendant created unreasonable noise in a work release facility for at least four virtually continuous hours, and the tirade, which was not political in nature, constituted an abuse of defendant’s right of free speech. Also, the Court has held that a request by hospital security officers that defendant stop making unreasonable noise was sufficient to support disorderly conduct conviction; the law does not require that person making unreasonable noise be asked to stop by law enforcement officer. If the State fails to prove, beyond a reasonable doubt, one of the three potential ways to gain a conviction, then you should be successful in defeating a charge of public intoxication. Another defense often seen to disorderly conduct charges in Indiana is free speech. This is often seen where a protester is arrested for disorderly conduct or a person is yelling at police who are arresting someone. Everyone has a right to free speech but there are limits to that right. In Price v. State, the Court held Defendant could not be punished for her particular speech when she protested the arrest of someone noisily in an alley on New Year’s Eve, which caused the neighbors to come out and look. In Snell v. State, when defendant screamed at officers arresting a man, claiming that they were “doing him wrong,” her speech was political in nature as an expression of her disagreement regarding the police actions toward the man. Thus, at her trial for resisting law enforcement and disorderly conduct, it was error to refuse her proffered jury instructions on protected speech under Indiana Constitution Article, I, § 9. But, in Dallay v. State, the Court found the disorderly conduct statute was constitutional as applied to defendant because even though defendant’s speech was political when defendant screamed and cursed at America and Jesus as defendant protested his arrest following a citation for littering, the disturbance defendant created interfered with the police officers’ duties and created a traffic hazard such that defendant abused defendant’s free speech rights under Indiana Constitution Article I, § 9. Also, in Blackman v. State, the Court of Appeals held that Defendant’s expression, which resulted in her arrest for disorderly conduct was not political and was therefore subject to rational review because: (1) defendant’s speech was ultimately ambiguous as to whether she was commenting on her own conduct or that of police officers; (2) the dual nature of defendant’s outbursts, coupled with her unreasonable noise levels, her refusal to comply with the officers’ instructions, and the resulting disruption of a police investigation, led to the conclusion that although defendant’s expressive activity began as political speech, it did not end as such; and (3) the court was particularly sensitive to attending policy considerations regarding the extent to which police officers had to endure defendant’s insults, threats to their personal safety, and the disruption of their investigations, in the name of preserving defendant’s right to free speech. Free speech defenses are constitutional challenges that are very complex. If you believe your arrest for disorderly conduct stems from a legitimate free speech activity, you should contact an Indiana Criminal Defense Attorney. Schedule a Free Consultation with an Indianapolis Disorderly Conduct Lawyer Today! While this article contains a lot of information regarding Indiana disorderly conduct laws, it is NOT a substitute for speaking to a qualified Indianapolis Disorderly Conduct lawyer. 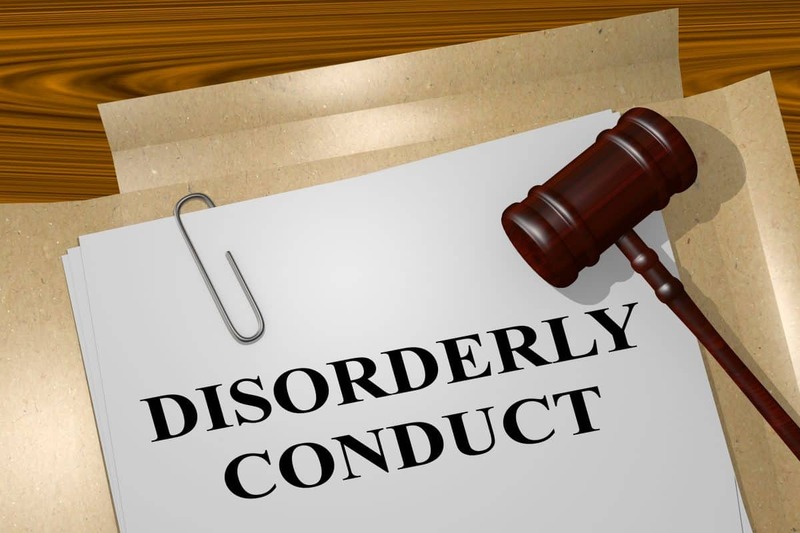 If you are facing a disorderly conduct charge in Indiana, it is important you speak to a qualified Indianapolis Disorderly Conduct Lawyer to discuss the specific facts of your case. Avnet Law understands the issues, the law, and can advise you regarding the Indiana disorderly conduct laws and any potential defenses you may raise. Avnet Law represents clients charged with crimes in Indianapolis, Noblesville, Fishers, Carmel, Westfield, and Central Indiana. Call 1-877-77-AVNET to Schedule a Free Consultation with an Indianapolis Disorderly Conduct Lawyer today or contact us below with any questions you may have about your disorderly conduct case.